Understanding that every industry has unique workflow needs, Crest have a new range of customisable Monochrome MFPs to make your job easier. Intuitive and smartly integrated our products simplify complex tasks and give you control while providing the reliability Toshiba is known for. Crest’s latest monochrome series delivers on our commitment to collaborate with clients to provide tailored, cost-effective solutions that meet your print, document management and content needs while helping you to meet your green objectives. A tablet-like, customisable user interface lets you enjoy the same sophisticated technology. Deliver impressive document output at a speed of up to 85 ppm and cover all print, scan, copy and fax needs of modern businesses. The Toshiba e-STUDIO 4508A has a new high-quality 22.9 cm (9″) tablet-style multi-touch screen can be personalised according to a user’s preferences and needs. It starts with the background image, which can easily be exchanged and continues with personalised views. You can change the order of the icons on the home screen, add or remove buttons and decide how many icons should be displayed per page, so that all functions present themselves to you in a way most useful to you. We want to make things as easy as possible for you. This includes handling complex workflows for you. Depending on the system you are using you have the possibility to process large batches of paper documents in one go either via the Reverse Automatic Document Feeder or the high-speed Dual Scan Document Feeder (DSDF). With the DSDF you can even do this with an impressive capacity of 300-sheets of double-sided documents and a maximum scan speed of 240 images per minute. Plus, you are not limited to standard weight, but can even process 35 g/m2 paper via the document feeder. In today’s business world it is you who decides how you want to print, how you want to share information and where it should be saved. The optional e-BRIDGE Plus connectors for Microsoft OneDrive, Google Drive, and Dropbox give you direct access to these cloud services and let you send your documents directly to or print from the service of your choice via the MFP. 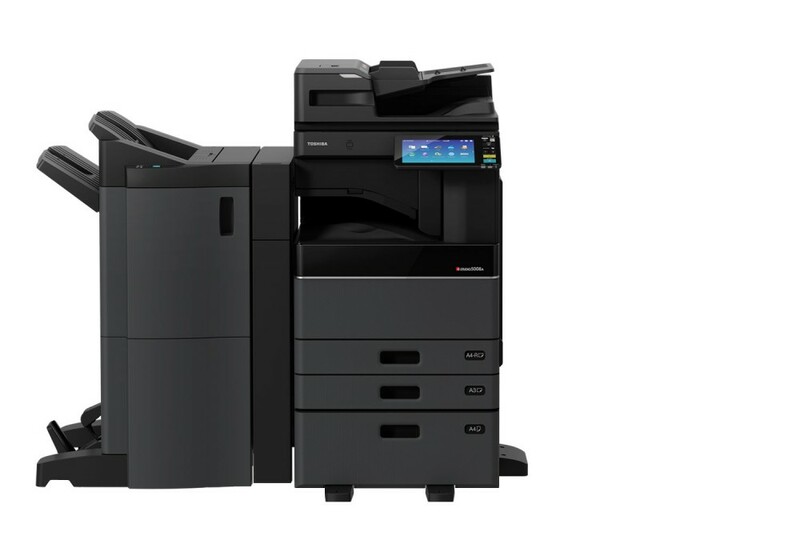 Mobile printing is important and Toshiba’s new systems give you full flexibility to do so. All models can easily connect to mobile devices via AirPrint (iOS), Google Cloud Print or the Mopria Print Service (Android). Various authentication features give you full control over who has access to your documents and devices. This way you can protect your business critical data and make sure that what is yours, stays yours. To streamline the user login process, we can ensure that all Toshiba e-BRIDGE Next systems support the use of card readers. All it takes to authenticate a user is a swipe of an ID card and they immediately have access to their functions and documents. Alternatively, you can set up passwords or pins for each user to grant personalised access to the systems. The Toshiba e-STUDIO 4508A model fulfils the highest security standards to protect your data from unwanted access. So whether you are looking for document security, device security or access security – our new system has it all. Teams and divisions in any business need to get a lot more done often using fewer resources and minimal space. That’s the thinking behind the e-STUDIO 4508A, too. Plenty of functions, lots of capacity, and a small footprint with a fresh, new look. First Copy Output Time clocks in at amazing 3.6 seconds for 35-50 pages per minute (ppm) models and 4.3 seconds for 20-30 ppm models. Multi Station Print Solution allows you to to send print jobs from your desktop and retrieve them at any convenient MFP by authenticating at that device, e.g. by simply swiping your badge. Print Around eliminates printing bottlenecks by allowing other print jobs to go around one job that’s held-up due to requiring a specific paper size or type. Job Reservation will queue up multiple copy or print jobs so users can send jobs whenever. Saddle/Fold Capabilities offer saddle-stitch finishing and the ability to fold without stapling. Embedded Apps let you send your documents directly to or print from Microsoft OneDrive, Google Drive and Dropbox via optional e-BRIDGE Plus connectors.